We recently did a post on Bounce Rate and one of my readers pointed out that there’s a good video by Google by Avinash Kaushik on this subject. Most of the ideas in the video are discussed in my post, but I would definitely recommend that you view this. 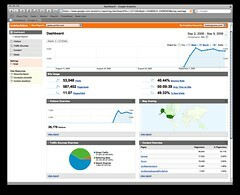 I strongly recommend that anyone interested in delving further into the world of web analytics visit Avinash Kaushik’s web analytics blog. Around half-way through the video Avinash mentions that the Bounce Rate on the slide he’s discussing is great, but it’s very difficult to see what it is. I did some stopping and starting of the video to save you the trouble and it turns out that the rate is 31.7%.